The absolute best way to eliminate rust from the surfaces of machines and other tools in your shop is to stop it from ever really getting started in the first place. This article will show you some good ways to do that, as well as how to completely remove it once it's already formed. There are times when we find, or are given, an old plane that we’d like to put back into use. How the plane was stored will directly affect the condition and magnitude of work required to ultimately use it as it was intended. 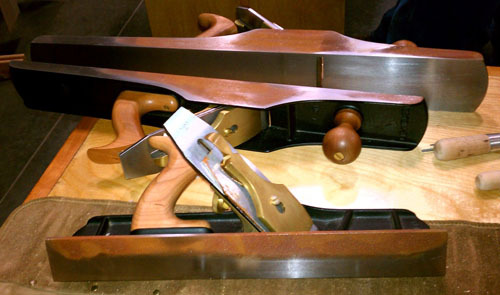 Since building my current shop several years ago I have had few, if any, noticeable rust issues on any of my tools. But this year, man oh man! Every cast iron machine top developed varying degrees of rust spots. Awful. And ugly! Prevent Rust & Corrosion – Easy! Hand planes, at least in the Down to Earth Workshop, seem particularly vulnerable to rust. Taking care of our sizeable investment in tools is critical, so when I read about Zerust NoRust non-slip drawer liner, it seemed worth a try. Just wanted you to know that I have recently installed the Wood Slicer Resaw Bandsaw Blade and it is amazing. It cuts wood like butter. I have already recommended this blade to a fellow woodworker. Thanks, Patrick W.